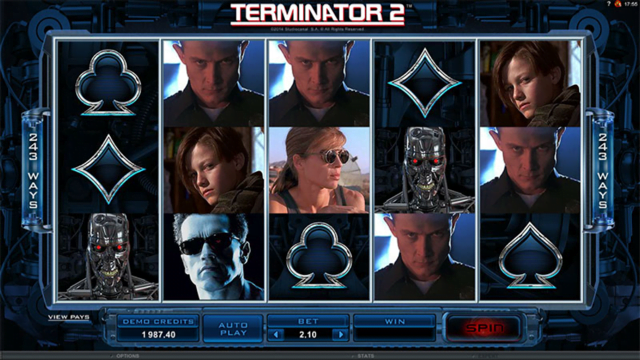 Terminator 2 slot machine from Microgaming is of course based on the legendary movie from 1991 directed by James Cameron and featuring Arnold Schwarzenegger as Terminator. The mobile slot uses the 243 ways to play game board, but incredibly this can increase to 1,024, which when combined with a jackpot of 1,500x can create some very big wins. There is also a free spins bonus with 10 free spins. Check out all the details in the full Terminator 2 slot review below. Undoubtedly the film that first laid the “sequels are always worse than the original” school of thought to rest, the Terminator 2 slot is the latest box office smash to get a video slot makeover from Microgaming slots. Featuring five reels and 243 ways to win in the base game, the Terminator 2 slot machine features all the hallmarks of the film it’s based on, with an authentic set of video clips and audio effects to match. The characters played by Arnold Schwarzenegger, Linda Hamilton, Edward Furlong and Robert Patrick all feature on the reels, with the T2 logo acting as a substitute wild and a ball of energy serving as the scatter symbol. Playable from as little as £0.30 per spin across all desktop, mobile and tablet devices, the Terminator 2 slot features a maximum base game jackpot of 1,500x players’ bet per line amount. The real incentive for playing, however, comes in the form of a lucrative free spins feature and a randomly triggered bonus. Dealing with the two unique gameplay aspects in order, Terminator 2’s main bonus feature is activated whenever three energy ball symbols appear anywhere in view. Whenever this happens, players will receive 10 free spins; and while that may not sound like a lot, the feature has a few tricks up its sleeve. First and foremost, the moment the feature begins the reels will expand to become a new 5×4 grid. This in turn raises the total number of ways to win from 243 to a whopping 1,024, meaning players are effectively over four times more likely to land winning combinations. Additionally, the T-1000 symbol will now morph to match any other character in order to create the highest value win possible. On top of the main feature, players will also get to see the reels through the eyes of the Terminator in the T-800 vision bonus. This will occur at random after any non-winning spin, and when it does, all of the higher value symbols on the reels will be scanned to reveal instant cash prizes to boost their wins. In truth, the Terminator 2 slot looks like it’s been dragged through the steel works a few times in terms of visuals, but the slot’s features are rewarding enough that we can forgive any minor cosmetic damage. Like the Terminator 2 slot review? Check out these as well…..